Corner cabinets are one of the most popular pieces of furniture present in modern households. It’s multifunctional and provides a great accent to the room. It is also a perfect way to display lots of stuff that would be a waste if you’d just stow them away in untouched storage boxes. Large corner cabinets can take up a lot of space but its size can be used to its advantage. They have ample storage for just about anything and often have a timeless appeal. Plus, they make use of what would otherwise be an awkward space or a wasted corner in the room. This medicine cabinet features a modern style with its all-white paint, crystal knobbed doors, and acrylic mirrors that are perfect for reflecting your modern bathroom. Angled at a corner and wall-mounted, it provides ample hidden shelving for your organizational needs. Works great in any room and complements other pieces of furniture as well as most home decorating styles. Provides ample hidden storage space. This must be hung on the wall (which might be an inconvenience to some buyers). Not all homeowners like acrylic mirrors. 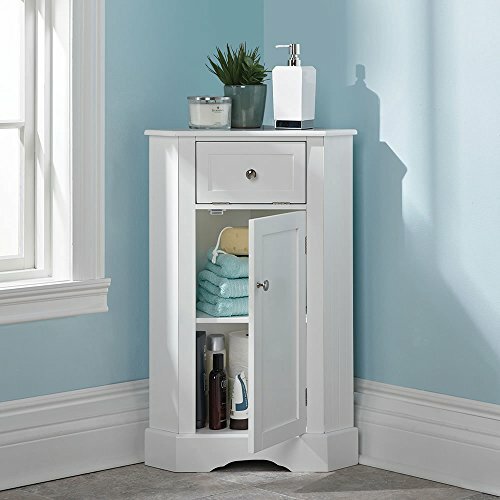 This bathroom storage cabinet will work well in any type of bathroom or powder room or even inside any other rooms. It has a tabletop, a drawer, and two shelves underneath so it maximizes floor space and provides ample storage for tissue, towels, and personal toiletries. Well-designed and easy to assemble. Can be used in any other rooms because of its modern design. For those who have a taste for elegance and beauty, this wooden bookcase will work perfectly in your interiors. It has wide open shelves for small trinkets and files, plus 2 door storage cabinet to accommodate plenty of stuff. Overall dimension is 50” H x 32” W x 17” D.
Wooden design cabinet is perfect for kitchen, living room or home office use. 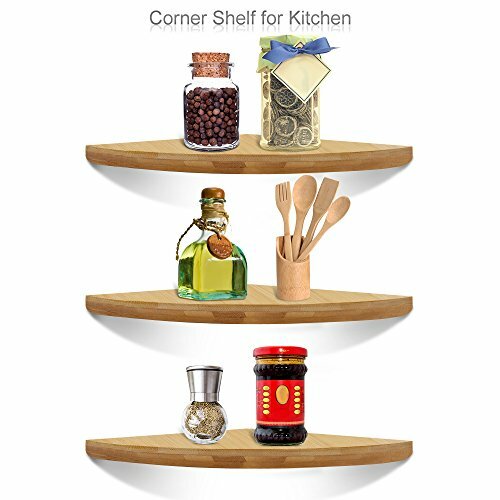 A stylish and functional corner shelves that can be used for storage in any room. It comes with sturdy flat surfaces and contemporary black finish. Great for displaying trinkets and other knick-knacks. Can’t store too many stuff on each shelf. Not tall enough to hold most medium-sized books. Here is some amazingly peculiar or out-of-of-the-blue large cabinets design that will satisfy the unique tastes of various home-owners. Will you be able to find something that would interest you? Check it out. This is an amazing piece of furniture to display your precious cutlery and crockery sets. It is tall, not wide, so it doesn’t take a lot of space. The wooden frame and see-through glass design is breath-taking. This curio is perfect for a display corner cabinet! Large interior with 5 shelving. Some holes don’t fit screws and knobs. The doorknob is on the right. This is another tall yet large see-through corner cabinet. Like all other see-through cabinets, its main purpose is to display collections. Mirrored back panel and glass wall design. Long wait times if you order online. Elegant and creative. Has the big wall clock frame design. The manufactured wood finish looks elegant and expensive. The top shelves can be adjusted while the bottom ones are fixed to ensure good foundation and safety. Assembly is pretty easy and straightforward. The diagonal sides will allow you to display your stuff at various angles. The fully mirrored back panel adds light and makes space look wider. The second curio cabinet has no knob in the front door makes it difficult for anyone to open. Entertainment is already more of like a necessity than a privilege nowadays. In the home entertainment system, we need to make sure that we get the best home corner entertainment cabinets that will not only make our home entertainment system look good, it also organizes everything and keeps things tidy. Got a large TV with no wall-mount brackets? This large entertainment cabinet will work great for you! It can hold large TVs and have plenty of space and compartments in the cabinet where you can store and display other entertainment appliances and accessories such as speakers, subwoofers and even playing consoles! Can fit up to 60″ TV. Classy and beautiful design. Looks much more expensive. Delivery concerns because of its heavy weight. This large entertainment cabinet is so wide and looks perfectly sturdy and expensive with wooden design finish. It is a perfect treat for a big living room and entertainment room spaces. The TV space accommodates up to 60″ which is considered a very large size for the modern TV. Its handsome chestnut finish gives it a charming versatile look that’s great for accommodating different styles, including traditional, modern, bohemian, and rustic. Provides many shelves and compartments. Assembly can be challenging and time-consuming. This entertainment set is for the modern designed interiors and is perfect for everyone! The TV stand is wide and has no upper frame so accidental falling of objects while watching is prevented and/or minimized. The spacious lower open shelves allow you to display items as well as other entertainment appliances. Keeps your home entertainment system clean, organized and tidy! This Shaker kitchen upper cabinet looks modern and elegant. It features soft closing doors and abundant storage space for better organization and where you can put small appliances as well as other cooker and cutlery sets that you wish to store. This wooden finish base cabinet resembles the old pantry in your old country house It has that country and cozy look that never goes out of style This sturdy large cabinet is great for any household that embraces coziness and traditional styling. Color and style can be old-fashioned. This is a large kitchen pantry that can easily fit into any interior. It has a white universal color that can blend well with any kitchen. It may be prone to stains, but as long as you are able to maintain the cleanliness in the kitchen area, this will look attractive to any guest and household member. Great storage solution without taking too much space. Neat-looking and doesn’t look bulky. 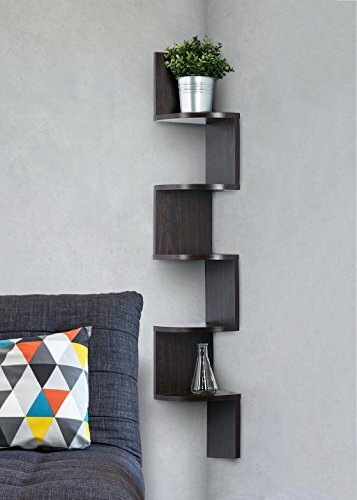 These corner floating shelves are lightweight yet super sturdy and can hold up to 44lbs. Its bamboo material works well for a naturally rustic, minimalist, or farmhouse look. Easy to assemble and mount. You may need to install brackets for support. This corner outdoor kitchen cabinet has a contemporary look that makes it easily a focal point around your grill. It has rear storage space and 2 integrated shelves to make use of underutilized backyard space. Secures belongings from weather damage. Has adjustable height levelers to accommodate uneven surfaces. Some people are lucky enough to have a large bedroom that can fit a walk-in dresser or a large cabinet to store all of their personal belongings. Most specifically, women tend to have a lot of personal effects that the ordinary cabinet won’t be enough to accommodate all of them. Instead of storing things in the dresser, and putting them back every after a shower, why not try these large corner bedroom cabinets instead? This large wardrobe armoire looks modern and elegant. On top of that, it has a lot of space inside for all of the toiletries and towels! The cabinet’s dimension is taller than wide, which means it does not take a lot of floor space, but will surely take care of all your clothing and accessories by keeping them organized. Tall, modern, and can fit most rooms. Slim and sleek, doesn’t occupy too much space. Can hang and fold garments. Won’t fit in bedrooms with low ceilings. This is a popular household item because of its sturdiness and sleek design. It’s stylish and practical so it’s a great storage solution that you can use in any room such as the home office, bedroom, or even in the foyer. 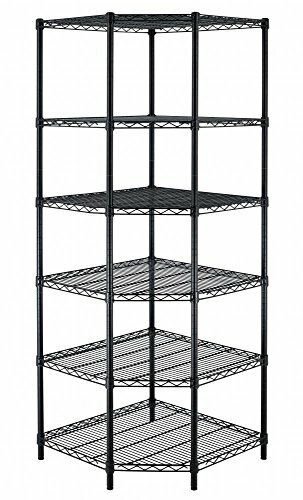 This heavy-duty steel wire corner shelf will keep your garage neat and organized. It’s heavy-duty and can be utilized for commercial space and comes with a 10-year warranty. Assembly is little to none. 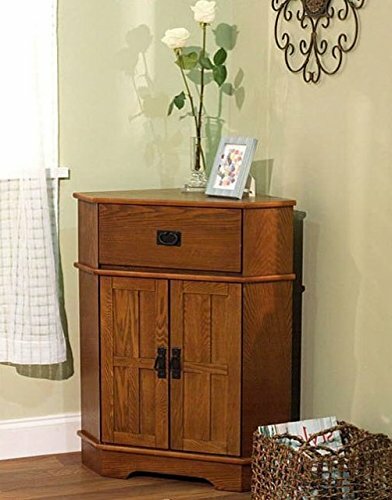 This wooden corner floor cabinet is sturdy and made to last. It’s stylish and will work well in a variety of styles for any parts of your home. It also has plenty of storage space in its upper and lower cabinet shelves. 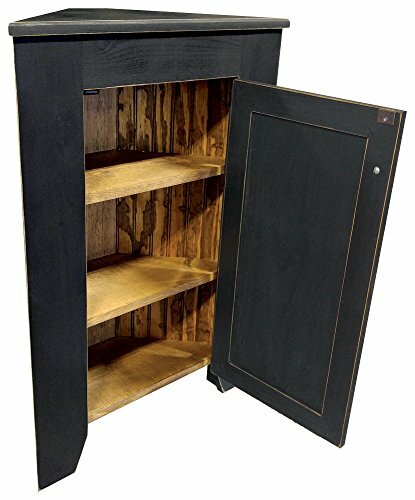 This corner upper storage cabinet comes with hooks so it’s perfect for hanging jackets, scarves, hats and bags in the entry. It also comes with double doors to conceal storage and a neat look. This corner cabinet is perfect for rustic or cottage style homes. It’s made of solid notty pine and comes with two fixed interior shelves, an underside clearance, and three openings behind the door. Good quality materials and craftsmanship. Color may slightly vary from the picture shown. Cabinets organize and display your stuff anywhere in your house! It is a good investment so you better invest in quality over quantity. Which of the large corner cabinets listed is your favorite, so far? There are many large corner cabinets of varying size and make to make your rooms tidy and organized. Some are tall, some can be a tabletop, and some may be slim or wide. On top of the aesthetics, pay attention to the build and quality and how are you planning to use it for. You can go cheap if you are just going to barely use it, but better invest in quality if you want to use it for a long time.